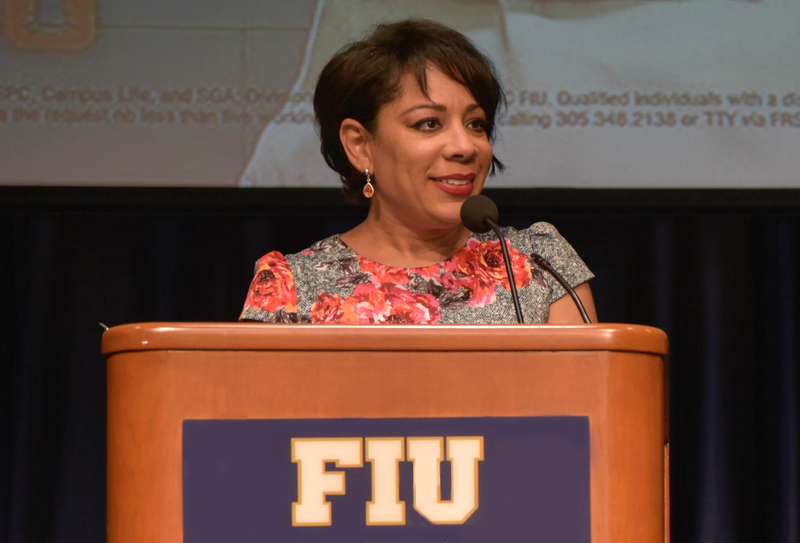 Amid the controversy surrounding the lack of color among 2016 Academy Award nominees, “Orange is the New Black” actress Selenis Leyva delivered an empowering speech to FIU students about her struggle to become a successful Afro-Latina actress in the United States. Leyva plays Litchfield Penitentiary inmate Gloria Mendoza on the Netflix show, a role she’s held for four seasons. But she didn’t always have a spot as a regular on a popular television program. In fact, before she landed the role as Gloria in her late 30s, she had just about given up hope for a steady career in acting and instead considered taking a “normal job,” as she called it, out of need to support her daughter. The reason: a lack of major roles available for Afro-Latina women. Even in the Spanish-speaking telenovelas she grew up watching, she didn’t feel like she fit in. The Bronx-raised daughter of Cuban and Dominican immigrants first learned that Afro-Latinas don’t land leading roles at age 13, when her school guidance counselor advised against applying to Fiorello H. LaGuardia High School of Music & Art and Performing Arts’ acting program. “People ‘like me’ should apply to secretarial programs,” she was told. But she applied anyway and went on to graduate from the prestigious performing arts high school. Even so, she still had difficulty breaking into the industry. But playing Gloria on “Orange is the New Black”—a show that, with female characters of many backgrounds, races and sexual identities, is a model for equal representation—has offered her a chance to explore a Latina role with a more in-depth storyline. Though Gloria is an inmate who went to prison for committing food stamp fraud, deeper layers of her personality are revealed as the show progresses: She’s also a victim of domestic abuse who is trying to stay involved in the lives of her children even from prison. This sort of character development is what sets Gloria apart from cameo appearances and other more stereotypical roles Leyva has encountered throughout her career. As for the debate on the lack of color in this year’s Academy Awards, Leyva feels the root of the problem actually begins while films and television shows are still in the writing stage. Fiorella Marquez, a senior majoring in psychology and a vice president of FIU’s chapter of the U.S. National Committee for UN Women, said she was grateful to hear Leyva talk about stereotyping in the media. “I think anybody that has fame can actually make a difference,” Marquez commented, pointing out that the show is a model for acceptance of differences. Leyva’s speech was the first major event that freshman Hilda Odias attended at FIU. Selenis Leyva was brought to FIU by the Student Programming Council.